Today marks the official last day of summer, so I thought it would be perfect to welcome fall with a transition look. For me, nothing screams fall like the color maroon. Anything in this deep, rich hue is a perfect fall piece in my opinion. 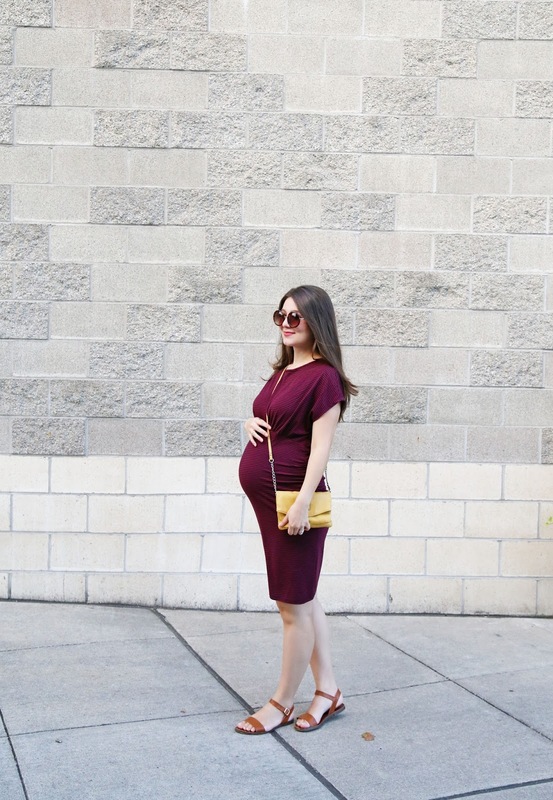 I have been loving this maroon maternity dress from Old Navy because of how comfortable it is. Believe it or not, this is actually the first maternity item I wore during my entire pregnancy, I was lucky to be able to get away with all the loose clothing I already had. Because I am in the later stages of my pregnancy (35 weeks! ), I have been suffering from swollen feet. A lot of my close-toed shoes don't fit me anymore, so I am still living in my summer sandals. Good thing the weather allows it because my body wants nothing but comfort lately! Anyways, let me know what you guys think about this look, I love reading all your comments! This color is gorgeous on you! Love following along your maternity style - you look better with each look! Loving the color of this dress on you babe! I love pieces like this because they are so versatile to style. I LOVE this dress on you, beautiful! The color is gorgeous on you and perfect for fall and it flatters your baby bump perfectly! I always admire the fit of these jersey style dresses on pregnant women, it always looks amazing! I love the yellow bag you paired with it, the colors look so good together! Thanks so much for sharing, beautiful, and I hope you're having the best start to your week so far!